The Page 99 Test: Victor Tan Chen's "Cut Loose"
Victor Tan Chen's "Cut Loose"
Victor Tan Chen is the editor of In The Fray magazine and a sociology professor at Virginia Commonwealth University who studies economic inequality. 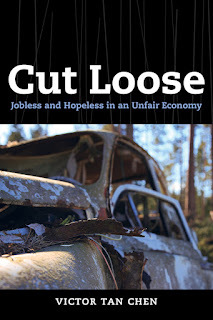 Chen’s latest book is Cut Loose: Jobless and Hopeless in an Unfair Economy, which tells the stories of men and women trapped in long-term unemployment. Page 99 talks about how the unemployed deal with the depression and anxiety that come from losing part of their identities. Work is central to our sense of self—it’s often the first question we ask someone we meet—and during the workday we build friendships that sustain us throughout our lives. Many of the people I interviewed felt isolated. Friends could no longer relate. Relationships with spouses and children became strained. Unable to provide the way they used to, they found themselves mired in blame and doubts. One smart way to help the unemployed is used extensively in Canada: action centers. When a layoff hits, the government sets up a help center for the company’s workers and trains some of them to work there. Unlike strangers at a government agency, peer helpers can assist their former coworkers with a personal and personalized touch. Lynn Minick of the National Employment Law Project points out that America’s social safety net for the unemployed largely helps the assertive and self-reliant. For those who might otherwise fall through the cracks, it makes a big difference if they have someone willing to step up for them, he says. Individuals internalize society’s belief that being unemployed is degrading, and their mental health and social ties suffer as a result. Regardless of how much they receive in benefits, the unemployed are less satisfied than those with jobs. Even in countries with generous unemployment insurance, the unemployed tend to die at a younger age. Society treats the long-term unemployed—whose numbers have remained at unprecedented levels since the recession—as lazy and useless. My book focuses on unemployed autoworkers, many who had worked hard for decades and, thanks to good wages and benefits, achieved a middle-class lifestyle. Now, suddenly, they are failures. Some became suicidal because they felt they had let their families down. Our society attacks the “takers” who live off government aid or the “pampered” union members who had the gall to attain a decent quality of life. It’s obsessed with performance and proficiency, self-improvement and success. But in a culture that values winning at all costs, the long-term unemployed are the ultimate losers. The solution, I argue, has to involve changing that culture. Follow Victor Tan Chen on Twitter and Facebook and learn more about him and his book on his website. Watt Key's "Among the Swamp People"
John Hagedorn's "The Insane Chicago Way"
Stanley I. Thangaraj's "Desi Hoop Dreams"
Gary Alan Fine's "Players and Pawns"
Ann Larabee's "The Wrong Hands"
Randy D. McBee's "Born to Be Wild"
Deanna Fei's "Girl in Glass"
Svetlana Stephenson's "Gangs of Russia"
Judy Brown's "This Is Not a Love Story: A Memoir"
David Morgan's "The Forge of Vision"
Peter A. Shulman's "Coal and Empire"